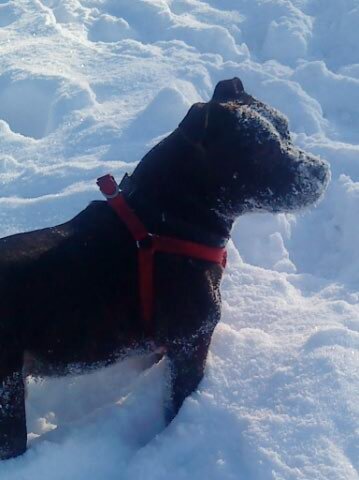 Please meet Buster, a Staffordshire Bull Terrier, male, approximately 6 years old. 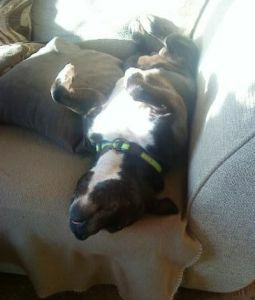 He is black brindle in colour with white markings and he is small in size. Buster was signed over to the Pound due to a change in his family's circumstances. Poor Buster was bewildered and frightened coming from a comfortable home into the noisy kennel environment and he quickly became sad and depressed. Luckily one of our wonderful foster carers was able to take Buster in to see if we could get his staffie smile back again. Buster was soon over the moon and happy to be back where he belonged - in a family home. He is a lovely friendly and steady chap who would slot easily into a home. He is living with an older child at the moment who he absolutely adores. He travels well, walks well on the lead and has a great recall and isn't possessive with his food - what a dream boy! As you can see Buster soon became part of family life proving himself to be brilliant with other dogs and children. 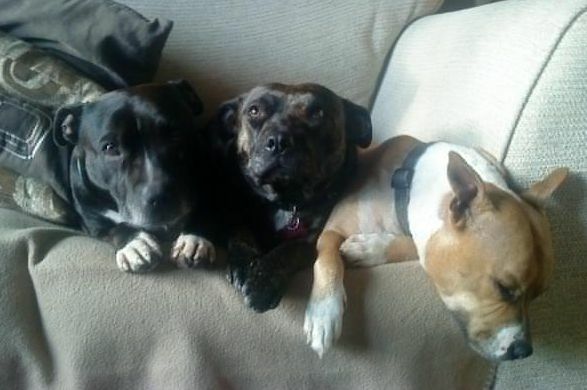 Buster is also sharing his foster home with 2 other staffies - he is great with other dogs and loves to play and will happily share the toys and beds. He enjoys a fuss and cuddle but isn't demanding. As he enjoys their company so much we are looking for a new home where Buster will have a doggy friend or two to have fun with! Buster does not like cats however! Buster didn't like being left on his own when he first went into foster but his foster mum has worked hard and crate trained him and he is now OK for a couple of hours but he would like a family where someone is around for much of the time to settle him in and to build up the time he can be left again in his new environment. Buster really deserves his own family; he has been waiting for a while and we really don't know why! His foster family are not going to be able to keep him after March, and we can't bear to see his sad face back at the kennels. He is currently in Foster in Stockport, and any prospective new owners will need to travel to this area to meet him. 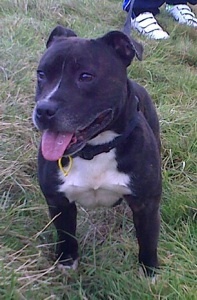 Buster is neutered, microchipped and vaccinated. We do not rehome to families where there are children under 7 years of age and we also ask that any pets you have already are neutered. If you think you could offer Buster a loving home then please complete our Rehoming Enquiry Form in the first instance.